Last night we played in the band concert. we played five songs. Of course we played hot crust buns. Then we played a clare la la loon. The third song we played was down by the station. 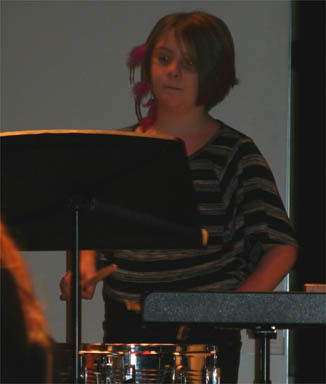 I had a lot of fun at the band concert. 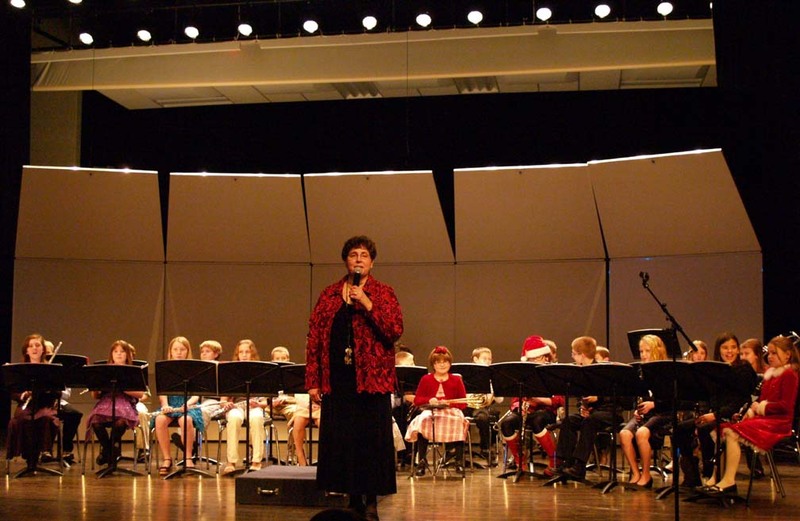 ~Sara M.
Yesterday, Dec 19, 2011 my class and I had a band concert at Onekama Consolidated School. My friends Katie and Chloe were scared and I was to. I was very scared when the curtens opened and every body was there. I played the flute with Hope, Haily, Deeann ,and Jodi. 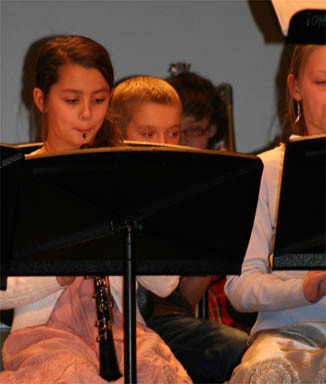 The first song we played was "hot cross buns". The next song we played was "Ad d lune". I had to sneeze. It was very exciting. Last night we had our first band concert. I played the oboe. I had a great time. 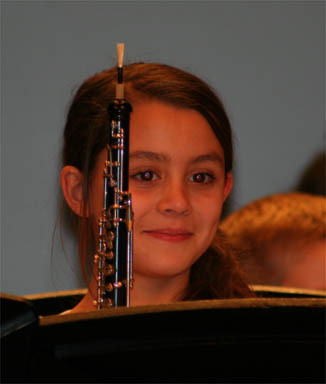 ~Chloe W.
At the concert I played a French Horn. I am the only French Horn player. Usually I play with the Trombones. At the concert we played four songs. I kind of messed up on the first one. It was our first concert. ~Brendan C.
Yesterday our class had a band concert. I played saxophone. It was pretty fun. 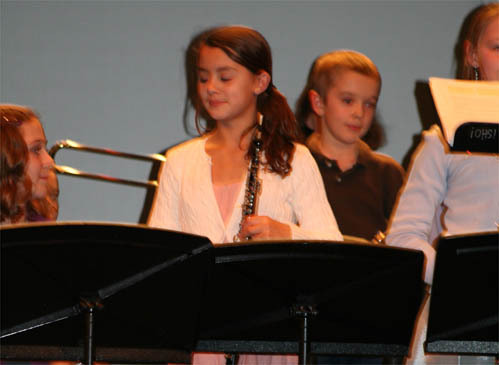 the songs we played were hot cross buns, down by the station, and a couple more songs. I forgot what the two other songs were. After we played the middle school played. then after the middle school played the high school played. 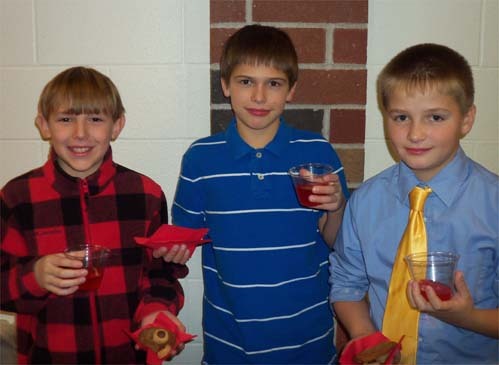 After the band concert was over Rylan, Aric, and I raced to the refreshments table. I had a fun time. ~Ben A. Yesterday We had a band concert . 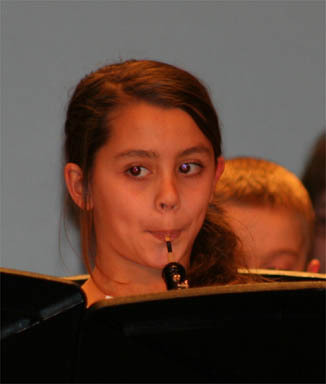 I play the clarinet. 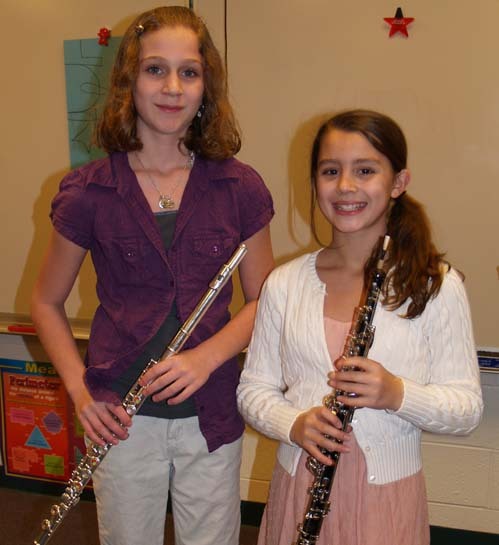 With my friend Haley G. We played hot cross buns then we played oh Xlare del a u. It was fun. I didn't stay for the for all of the show I had to leave. 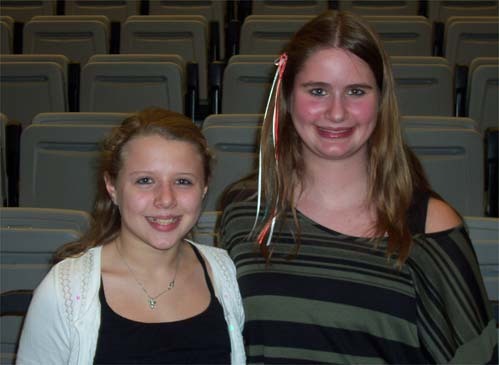 ~Ashlee C.
Our class was first at the band concert. We were nerves and my friend was shaking. All of us got on the stage . We played Hot cross buns then we played all of the song that we had. The crowd liked are concert. That was the best day ever. ~Kyle C.
Yesterday was the band concert. I play the trombone! I think that it was a pretty good concert. A few people played solos! I didn't play one though. The trombones got a soli but no solo. My friends both play the trumpet. It was a fun concert! ~Jarret B. 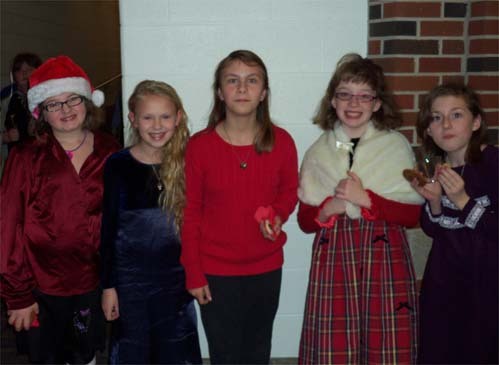 On 12-19-11 the 5th grade had a band concert. The concert was in the cafeteria. They pulled out the bleachers in the wall. There was a snack table. 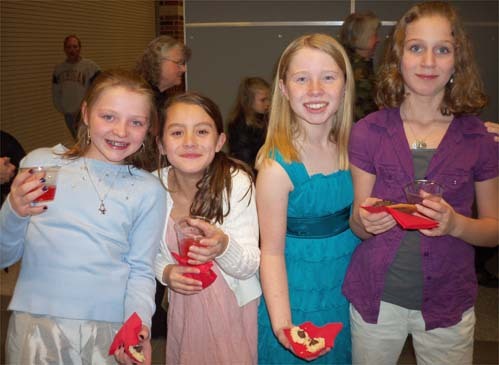 Only bad thing about it was you could only get snacks at the end of the concert. The concert wasn't that long for us. We played Hot Cross buns,Au Clarie la lune, Down by the Station, and Merrily we roll along. There was about a 100 or more people there. There was about 15 of us playing in the concert. High school and middle school played when we were done playing. The concert was like 3 hours long or 2 hours long. We had a great time playing in the concert. 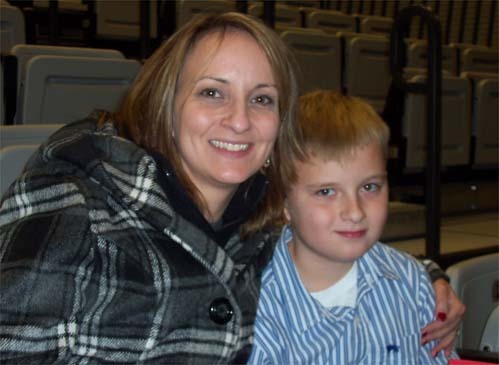 ~Rylan C.
Last night we went to the band concert for middle school fifth grade and high school. 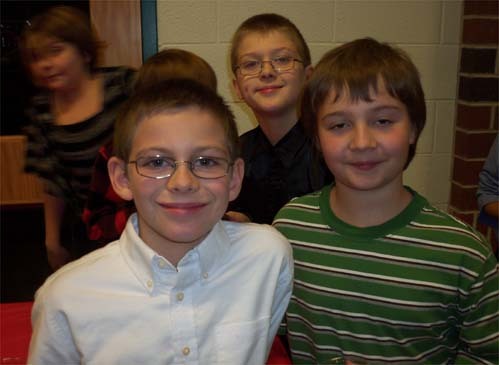 I was kind of nervous because I've always had a bit of stage fright. It turned out not to be to bad. First we played hot cross buns then we played Au Claire Da La Loon 3rd we played down by the station 4th we played merrily we roll along and finally we played good King Wencelas. After we got cookies and some sort of red drink that tastes really good. Then back in the band room we were allowed to take a candy cane. ~Amanda B. At the band concert I wore all black. We played songs like hot cross buns. That song was my favorite. After we were done playing we went to the food table. I took a bite of a cookie and then they said not till after the concert. So I stuffed it in my pocket. Then I split it with Carson. During the concert I said I peed but I did not. It was a fun concert. ~James S.
The concert was a bit scary when we went on the stage. Then it was time to play our instruments. 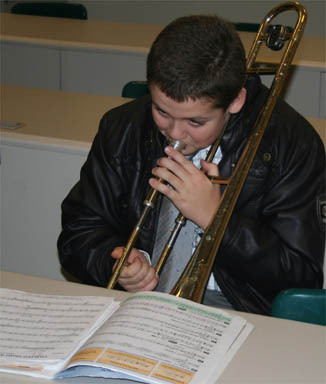 My instrument was the Trombone. I played at the far back which I really like. I'm not sure if I'm going to play next year, but I had an awesome time. ~Samantha B.